The new Trestle Stair connecting the Marsupial Bridge with Commerce Street was opened in August. According to the website of La Dallman, architects of the Marsupial Bridge as well as the new stair, the new project “…repurposes a historic rail trestle rising gently along the valley edge as a public promenade and event space…. 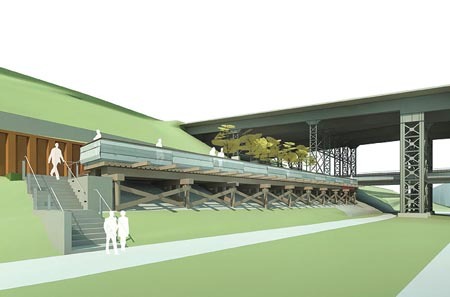 The heavy timber structure that once carried freight trains now supports a concrete deck, integral benches and cantilevered overlook. The width of a rail car, the new deck allows the existing structure to read as both sculptural presence and historic remnant. Concrete stairs provide end connections, and an Ipe wood terrace extends to the adjacent hillside, enveloping a grove of native quaking aspen trees. The stair fills a need, connecting Commerce Street to Riverwest, Brewer’s Hill, Harambee and, across the Bridge, Brady Street and the Lower East Side. Go enjoy our newest neighborhood gem.